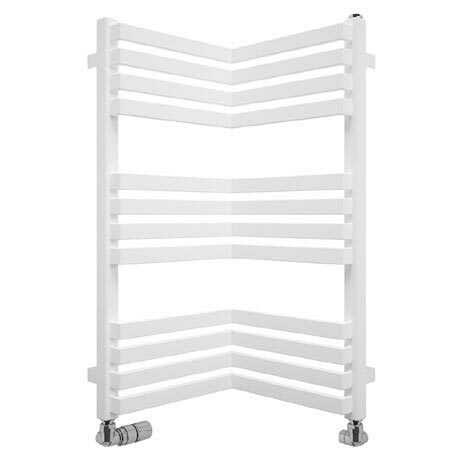 The Zion towel rail features an innovative L-shaped body made for fitting into a corner, its space saving design makes it ideal for small bathrooms and en-suites. Crafted from high-grade steel and finished in Soft White Matte. Each towel rail is leak tested twice during the manufacturing process and is copper infused welded which ensures all gaps are correctly sealed and provides an invisible joint. A special coating of Oxsilan® is applied which offers the same degree of corrosion protection as ten times thicker zinc phosphate layers. The Zion offers superb heat output and plentiful hanging space for drying towels quickly and efficiently.